Pantograph lift with foot-operated hydraulic pump (SRB1394) or with air-hydraulic pump (SRB1394P). Lifting height of 800 mm. The particular design of the run-up ramp allows easy rear wheel removal. Mechanical locking device for absolute safety when lifted, with automatic unlocking before descent. The lift can be supplied either with manual vice (S1394A1) or with pneumatic vice (S1394A2) to block the front wheel. Wide platform (1000 mm) to lift garden machinery. Lift with foot-operated hydraulic pump (SRB1394T) or with air-hydraulic pump (SRB1394TP). Scissors lift with air-hydraulic pump (P) or with electro-hydraulic control box (E). Great lifting height of 1000 mm. The rear centre part of the platform can be easily removed to facilitate rear wheel removal. Mechanical locking device for absolute safety when lifted, with automatic unlocking before descent. The lift can be supplied either with manual vice (S1394A1) or with pneumatic vice (S1394A2) to block the front wheel. 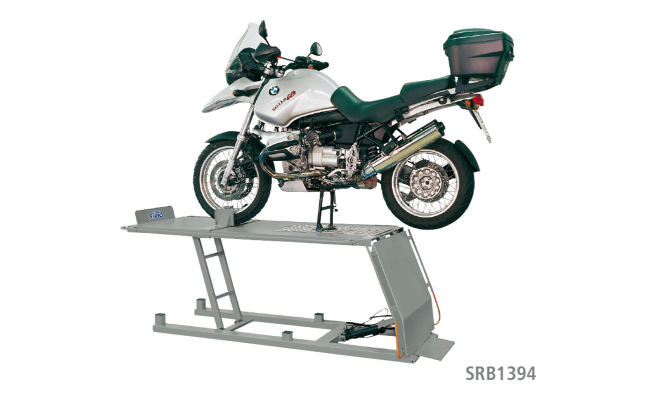 Very wide platform (1450 mm) to lift 3-wheel vehicles and micro-cars. Scissors lift with air-hydraulic pump (TP) or with electro-hydraulic pump (TE).